Little Mashies is the result of one mum's desire to make it easy and convenient for parents to provide their children with highly nutritious, home-made food in a handy on-the-go pouch that kids will actually want to use. Given that little children can be fussy eaters she knew the importance of making meal times fun, and so the cute Little Mashies monsters were born. Little Mashies Food Pouches are made with the highest quality components, are reusable up to 100 times and are recyclable. All packaging and brochures are made from recycled materials, and the business follows best practice when it comes to caring for the environment. 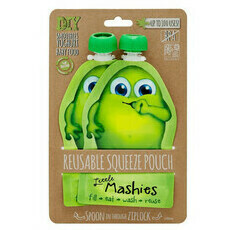 Little Mashies Food Pouches are BPA Free, Pthalate Free, PVC Free and Lead Free.